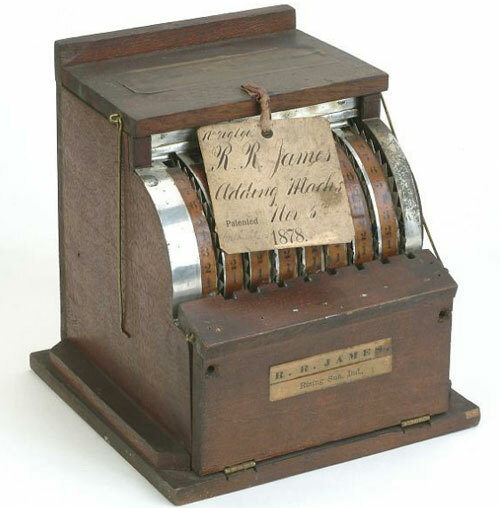 On November 5, 1878, Reuben Rodney James (1826-1904) from Rising Sun, Indiana, took out a US Patent №209690 for an adding-machine. It seems the device never went into production, and only the patent model survived to the present time (property of Smithsonian National Museum). The machine is a wood, metal, cork and paper device, with measurements: 21.5 cm x 20.2 cm x 20.2 cm. It has eight toothed revolving counting wheels, loosely mounted and rotating on a common axis. Around the periphery of each wheel, the digits from 0 to 9 are printed repeatedly. Attached to each cylinder is a toothed revolving disc. The machine has a wooden case with a tin cover over the wheels. On the cover, next to each wheel, there is a slip of paper labeled with the numbers from 1 to 9. To enter a number, the operator places his finger at the tooth next to the digit on the appropriate paper slip, and rotates forward. The sum appears in slots in the metal cover, near the top of the machine. Each counting wheel has four lateral inclines or cams linked to a weighted pawl-lever, to engage the next wheel on the left, so as to carry ten when the numbers added on the wheel on the right exceed ten. Who was the inventor Rueben Rodney James? Reuben Rodney James was born in Rising Sun Dearborn Ohio, Indiana, on 21 August 1826, to Henry James (1797-1880) and Rebecca Hatch Athearn (1805-1834). Reuben was the first survived child in the family, after Lucian Abram (b. 1824), who died as a baby, and before Ann Eliza (1829-1867), Rebecca Marian (b. 1831) and William (b. 1834). After the early death of his mother Rebecca in August, 1834, his father married again to Amelia Maria Disney (1814-1872) and had 4 more children. According to US Census records, Reuben James was a farmer (1850, 1860) and then a proprietor of a woolen mill (1870) in Rising Sun, Indiana. Reuben James and his fellow Rising Sun resident Mirabeau Norman Lynn took out a patent (US Patent №238122) for a grain meter in 1881. In 1857 Reuben Rodney married to Rebecca Moore (1832-1907) and had 6 children—Harry (1858-1885), Carrie (b. 1860), Mary Mollie (b. 1863), George (b. 1870), Nellie (b. 1873) and Fanny (b. 1874). Reuben Rodney James passed away on 25 January 1904 in Randolph, Ohio, Indiana.